Intel continued to top all other chip companies in R&D expenditures in 2016 with spending that reached $12.7 billion and represented 22.4% of its semiconductor sales last year. Intel accounted for 36% of the top-10 R&D spending and about 23% of the $56.5 billion total worldwide semiconductor R&D expenditures in 2016, according to the 20th anniversary 2017 edition of The McClean Report that was released in January 2017. Figure 1 shows IC Insights’ ranking of the top semiconductor R&D spenders based on semiconductor manufacturers and fabless suppliers with $1 billion or more spent on R&D in 2016. Intel’s R&D spending is lofty and exceeded the combined R&D spending of the next three companies on the list. However, the company’s R&D expenditures increased 5% in 2016, below its 9% average increase in spending per year since 2011 and less than its 8% annual growth rate since 2001, according to the new report. Underscoring the growing cost of developing new IC technologies, Intel’s R&D-to-sales ratio has climbed significantly over the past 20 years. In 2010, Intel’s R&D spending as a percent of sales was 16.4%, compared to 22.4% in 2016. Intel’s R&D-to-sales ratios were 14.5% in 2005, 16.0% in 2000, and just 9.3% in 1995. Among other top-10 R&D spenders, Qualcomm—the industry’s largest fabless IC supplier—remained the second-largest R&D spender, a position it first achieved in 2012. Qualcomm’s semiconductor-related R&D spending was down 7% in 2016 compared to an adjusted total in 2015 that included expenditures by U.K.-based CSR and Ikanos Communications in Silicon Valley, which were acquired in 2015. Broadcom Limited—which is the new name of Avago Technologies after it completed its $37 billion acquisition of U.S-based Broadcom Corporation in early 2016—was third in the R&D ranking. Excluding Broadcom’s expenditures in 2015, Avago by itself was ranked 13th in R&D spending that year (at nearly $1.1 billion). 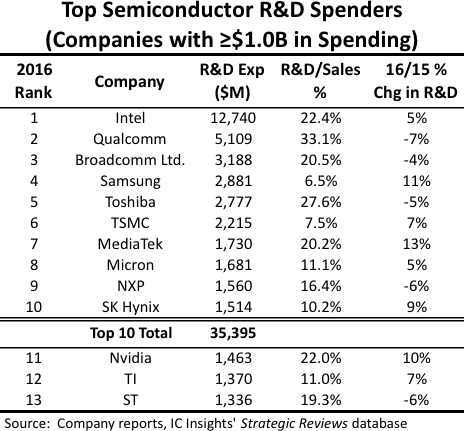 Memory IC leader Samsung was ranked fourth in R&D spending in 2016 with expenditures increasing 11% from 2015. Among the $1 billion-plus “R&D club,” the South Korean company had the lowest investment-intensity level with 6.5% of its total semiconductor revenues going to chip-related research and development in 2016, which was up from just 6.2% in 2015. Toshiba in Japan moved up two positions to fifth as it aimed its R&D spending at 3D NAND flash memories. Foundry giant Taiwan Semiconductor Manufacturing Co. (TSMC) was sixth with a 7% increase in 2016 R&D spending, followed by fabless IC supplier MediaTek in Taiwan, which moved up one position to seventh with 13% growth in R&D expenditures. U.S.-based memory supplier Micron Technology advanced from ninth to eighth in the ranking with its research and development spending rising 5% in 2016. Rounding out the top 10, NXP in Europe was ninth in 2016, slipping from sixth in 2015 and SK Hynix grew its R&D spending 9% to complete the list. Fabless Nvidia just missed the cut with a 10% increase in expenditures for research and development. Semiconductor consolidation played a factor in industry R&D spending rising just 1% in 2016 to a record-high $56.5 billion after a 1% increase in 2015 to $56.2 billion. The slowdown in industry-wide R&D spending growth also corresponded with weakness in worldwide semiconductor sales, which declined 1% in 2015 and then recovered with a low single-digit increase in 2016.